6.33 points at 9 votes (rank 559). A crazy scientist who is only known to the secret services under the code name "The Enemy", recently developed a new type of nuclear bomb with an explosive force that could reach immense dimensions. Allegedly, one can destroy all of mankind with this single bomb. 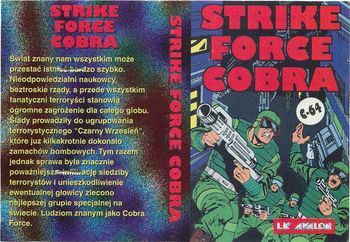 The Strike Force Cobra, a four-man unit that is under your command is now supposed to stop this super-villain. This is most effective and safest by destroying the bomb that is stored deep in the underground lab of the crazy professor. 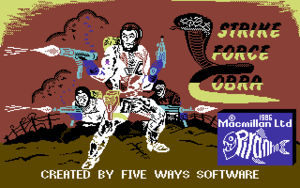 Get into the fourth level of the lab with at least one member of the Strike Force and destroy the bomb. 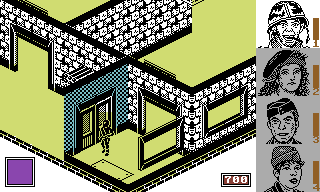 The player moves with the four chosen special agents through the hostile base. This was designed in a three-dimensional view, but unfortunately, they skimped on colours. 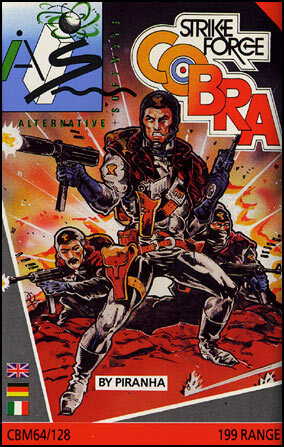 The C64 version was mainly converted silimar to the originals on the Spectrum and Amstrad. The laboratory, which is the enemy's headquarter, consists of multi screens that partially overlap. 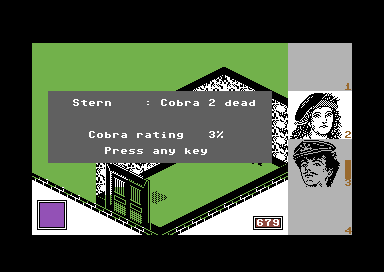 Touching hostile units or the many traps in the base costs life energy, that is shown as a bar at the right border of the screen next to the portraits of the Cobras. The traps are amongst others lasers, spring guns and high voltage fields. At the beginning you can compose your team from eight different soldiers. Some doors can be opend by kicking them in, others by switches or special plates in the ground. 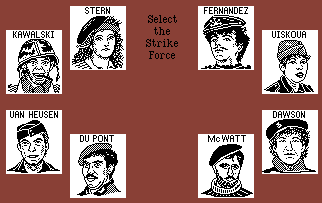 For some of the puzzles you need to combine the members of the Strike Force, e.g. it could be necessary that one of them must stand on a special plate so the other one can go through the now open door. 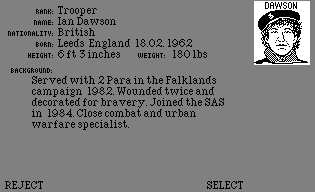 There is a time limit for the mission, the counter runs down at the lower border of the screen. 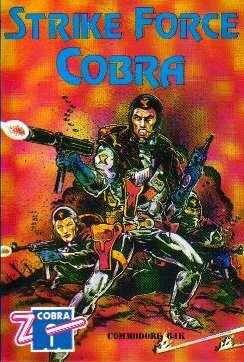 The Cobras are armed with machine guns and grenades. 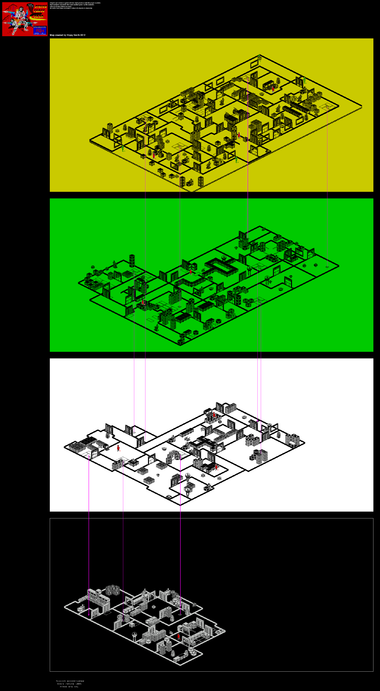 The lab consists of four levels. The bomb is on level 4, the lowest. The game starts on level 1. To enter the room with the bomb you need a 9-digit code. Most of the functions were put on several keys. It is also possible to steer only with the keyboard and without joystick. There are seven scientists in the lab who where all kidnapped by the enemy. Each of them knows one of the numbers of the code. The two numbers that are left can be cracked by the protable computer, but you first need to find all scientists. With the complete code you go to level 4, enter the storage room with the bomb and shoot down the computer to free the way. 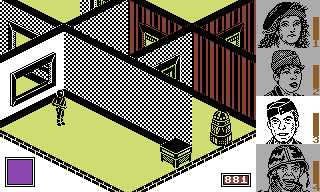 This map from Speccy Screenshot Maps is enormously helpful to solve the game. Shmendric: "The controls and the fight with the weapons are just too unprecise to let it pass as a shooter. 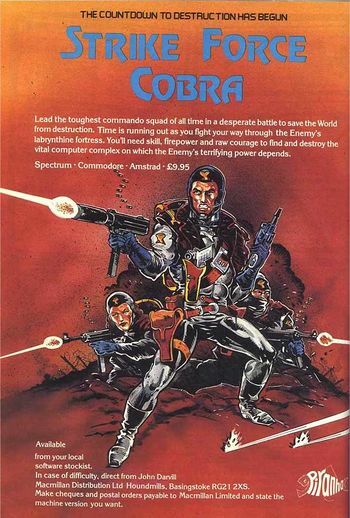 If you have got the hand of it and can find your way around on the map, you can definitely have a bit of fun with the B-movie-agent troup." There is no score, but a percentage value stating how may secrets of the game were solved. This page was last modified on 22 February 2016, at 21:06.